As we all know, the kitchen is the heart of the home, and by far the most active space we use. That said, it’s also probably the hardest place to see clutter-free. The countertops specifically can become a one stop drop shop for nothing and everything we deem necessary. I’ve seen it all, from mail all over the counter, to every electronic stacked, to baby bottles scattered throughout. I get it, through the hustle and bustle of every day it’s just easy to plop things down and deal with it later. Problem is, you very rarely end up dealing with it later. Next you want to split the items you listed into their respective categories. For example, mail with mail, bottles with bottles, cookies with cookies, etc. However many categories you have are now your zones. Dedicate a space on your countertop for each of these zones. Once you have that, the next step is creating a storage system. Get a bin for mail sorting, a countertop drying rack for baby bottles, canisters for your cookies, a utensil holder for your cooking utensils. So on and so forth. The pic above is my own countertop and I have the following zones. A bowl for electronics under the charging station. Canisters for things I use when I cook. Utensil holder for cooking time. What’s most important will be different for everyone. 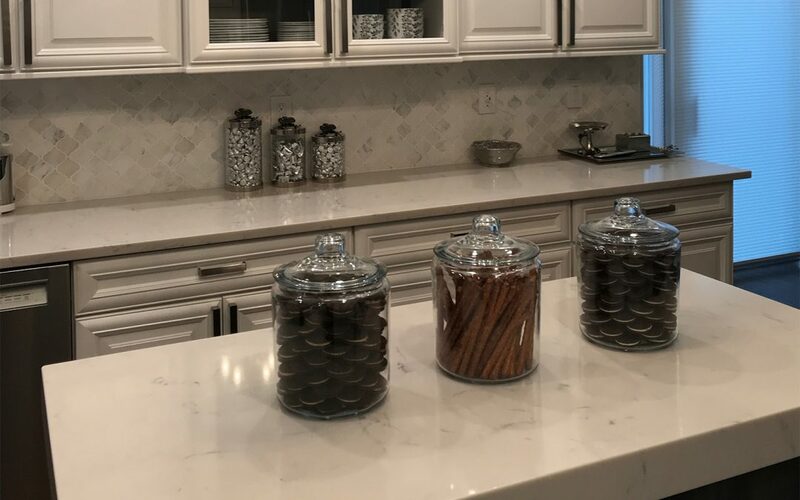 As long as you have dedicated zones for what you seem to always have out on your countertop, these items will have no choice but to remain organized. I definitely suggest a throw all tray. Keep a little box for your change there too. A little dish for assorted candies, a place for your guests to maybe put their phone down, or even keys. Cookie canisters. Fill them up with your family’s favorite cookies – so convenient and easy, and looks great! Mail bin. You can find these in any Home Goods type store. They come in all different styles and sizes. Throw your mail in here instead of a cluttered stack just anywhere. Its organized, easy to find and access, and clutter free! A zone for cooking items such as flour and sugar is important too. I suggest clear glass canisters for these. Set up the zone next to your cooktop for convenience. It will save you lots of prep time when you’re about to start cooking. Hope you enjoyed these tips and tricks!! Now your countertop chaos can be dealt with easily, and for you to enjoy!